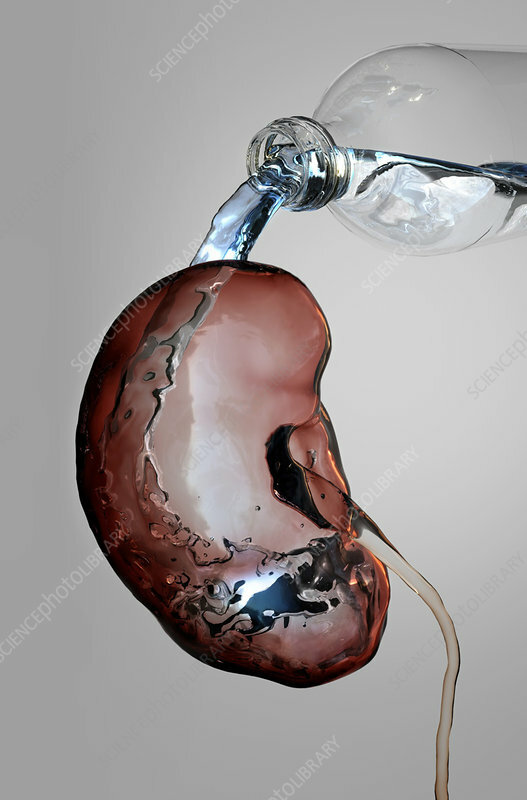 Conceptual image showing water running through a kidney. Hydration is essential for a healthy human body and normal kidney function. Drinking a sufficient amount of water helps to cleanse the body of waste products, and the kidneys play an important role in that process by filtering out waste that is eventually excreted as urine. Dehydration causes urine to be more concentrated with waste products, which can lead to urinary tract infections or kidney stones. Staying hydrated ensures that the kidneys will be able to filter out waste products at a sufficient rate, meaning that urine will be more diluted and less concentrated with waste.